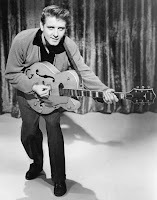 "...But there ain't no cure for the summertime blues..."
According to the webpage www.eddiecochran.info, on January 8, 1960, rocker Eddie Cochran--perhaps most famous for "Summertime Blues"--completed his last formal studio recordings, at Goldstar Studio in Hollywood. The next day, he left for an extended tour of the UK, arriving there on January 10th in order to join up with the Gene Vincent Show. Several popularly successful television performances featuring Cochran and Gene Vincent were broadcast in the UK over the next several weeks. As is well known, Eddie Cochran never left the UK alive, having been killed slightly over three months after his arrival, the result of an automobile accident that occurred near 12 midnight on April 16th, 1960; he died from his injuries the next afternoon. (I note in passing that author Albert Camus was killed in an automobile accident on January 4, 1960.) In an improbable twist, according to www.eddiecochran.net, the name of the cab driver that fateful night was--George Martin . . . not the George Martin who would later, famously, produce The Beatles, but the serendipity is startling. Perhaps especially so, since one of the earliest known recordings of The Beatles (or, more precisely, three-quarters of the band that would become The Beatles), found on The Beatles' Anthology 1 (1995), is virtually a note-by note copy of Eddie Cochran's "Hallelujah, I Love Her So," recorded by the future Beatles sometime during the spring of 1960. "Hallelujah, I Love Her So," released in the United States in October 1959, was the last single released in the UK during Cochran's lifetime, released in the UK in January, 1960, no doubt in order to coincide with his UK tour (although I strongly suspect that such extended appearances would not have called "tours" in those days). No doubt John, Paul, or George--or all three--picked up the single sometime soon after its UK release; one strongly suspects that while Cochran didn't appear in concert in Liverpool during his last tour, he made concert appearances (e. g., Manchester) that would not have been impossible for the young lads to attend. Although John Lennon was always forthcoming about being an Elvis Presley fan, at the time Elvis wasn't doing much recording: he was in the Army--and, on January 8, 1960, Elvis was in Germany, celebrating his 25th birthday. His Army service was coming to an end, but he still had a few weeks left. Happily, Eddie Cochran was, deservedly so, inducted into the Rock and Roll Hall of Fame in 1987.